I am surely more used to hot rather than cold weather, but I can adapt. Or at least try and then keep on saying I'm cold. Lucky readers, you only get the images, not the soundtrack! Big Knitwear, cute skirt, scarf, and my new passion: Ugg Boots. 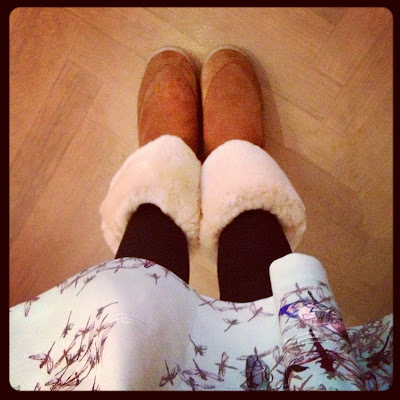 I can already hear my fellow Parisian Ladies moaning, yes I did step into the Ugg world and it's probably going to safe loads of freezing afternoons queuing for Museums or Exhibitions so i take full responsability on the fashion faux pas!